Suspended from a burnished golden rope is an intricate pendant with micro crystals arranged in arched rows representing a peacock feather. The colors include celadon green, aquamarine teal, sapphire, and amber and blue topaz. Three additional accent strands; a rope chain, a strand of clear crystals, and an aquamarine crystal pendant, add interest to the necklace as well as to PEACOCK earrings. 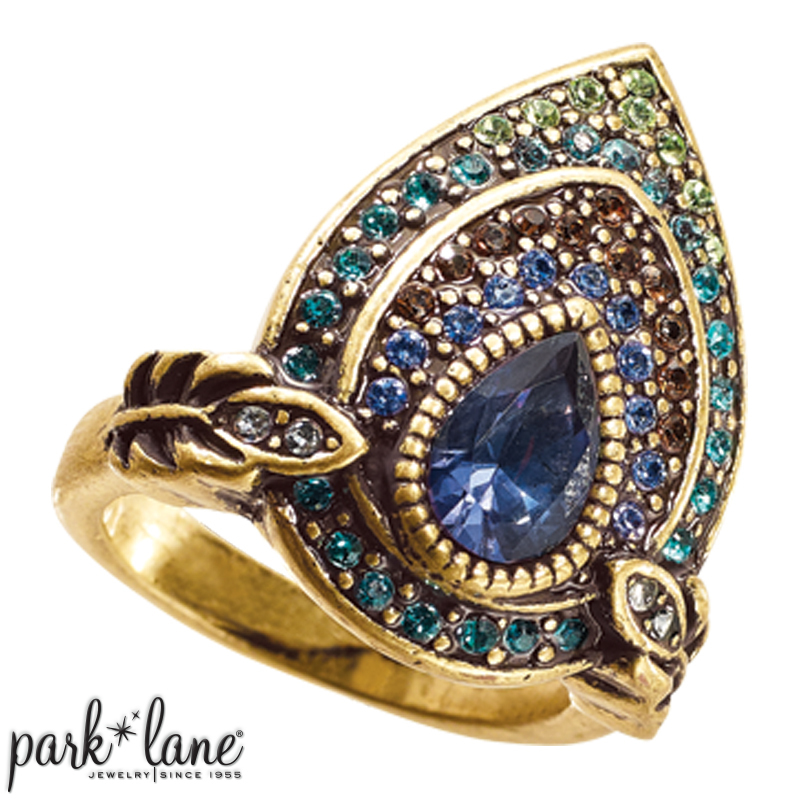 PEACOCK ring`s teardrop-shaped, faux sapphire is arched by colorful sections of pave crystals. PEACOCK ensemble is a masterpiece. Wear it proudly! Necklace is 18 inches long plus a 3-inch extension. Ring is available in sizes 5-10. Bracelets: Amber Lights, A La Mode, Signature-olivine. Rings: Truffles, A La Mode, Isabella, Emerald City, Signature-olivine Layering option: could wear with Piccadilly or Jade necklace.